I adore this tent the frontier 8 is the best tent I have ever owned . 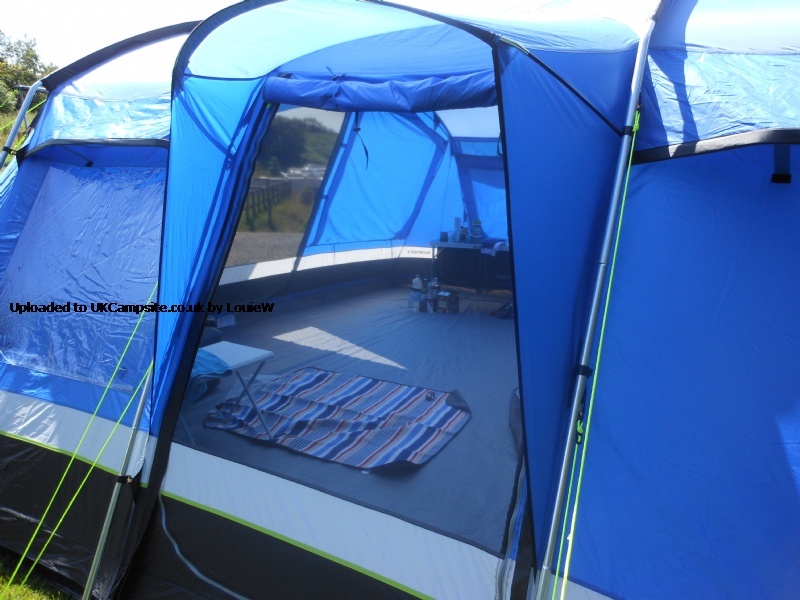 We bought it last August 2015 , we camped in her for a few weeks and during that time we encountered storms of south westerly gales 6 to 7 gusting to 8 ,( our last tent went down in a 3 to 4 force winds ) The forecast was late coming in and we were not able to pack away at such short notice , yes it was scary , I didn't know my equipment enough to trust it and the storm lasted four hours , but she stood her ground and we couldn't believe she survived the night and we were all safe ( Me , Hubby and two dogs ) I wouldn't recommend staying in storms of such high gales and wouldn't do it again given the chance either .However great tent , great space plenty of room for large family or small . 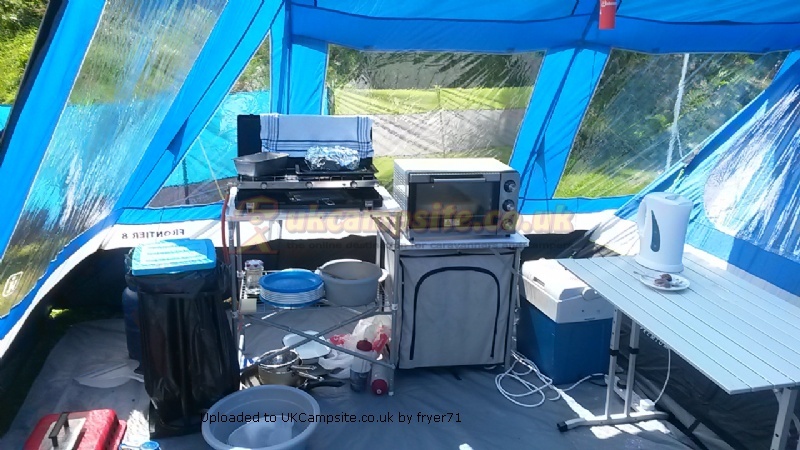 Very warm , no leaks , great ventilation ,great sized windows and good design of the curtains , carpet is great fit , highly recommended.Its one of those tents that is the envy of the tent field even from the caravan people , we have gone out for a little ride in car and returned to other campers tents and caravan people alike asking can they come in and look around .A few of my friends have said they now want one . 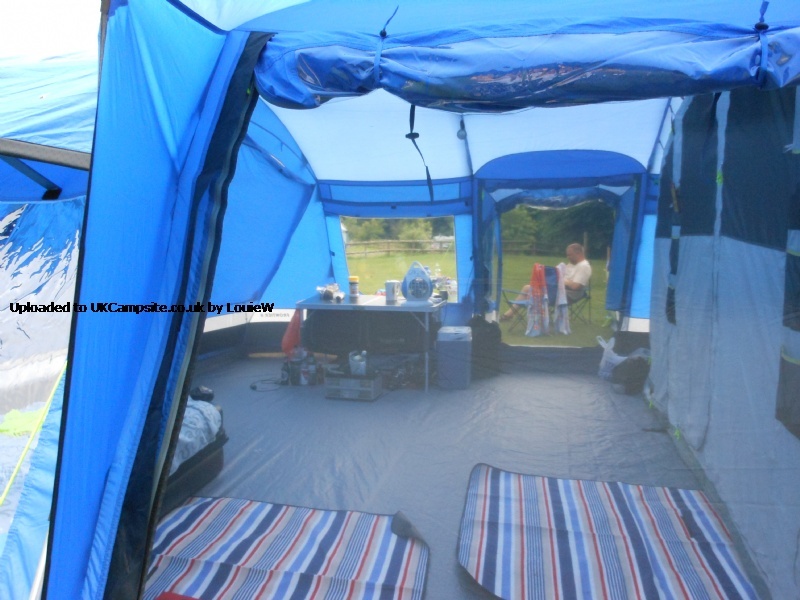 We purchased this tent as a bundle with footprint, porch, and carpet in May 2015 and just used it for the second time, camping in Mablethorpe for 2 weeks. It withstood torrential downpours, sunshine and very strong winds but all were not a problem as the tent stayed warm, sturdy and dry. Took us around 45 mins to erect and same to take down and pack away. With the porch attached it is absolutely huge at 32ft long and 19ft wide so a lot of sites don't have pitches big enough. We were the envy of many of the other campers who stopped as they passed by to comment on it and have a look inside at the spacious living areas. My only complaints of this tent was the fact that the bedrooms could have been bigger as found them quite small for 8 people. Also would have liked ventilation and curtains in the porch as the majority of porches do provide privacy too, but this one doesn't. Got to be very careful as the outer zips tend to get stuck a lot. 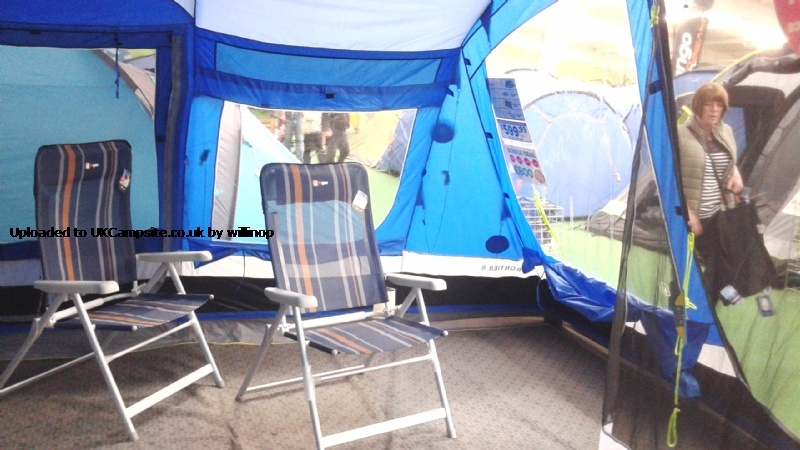 This tent also has a very handy storm porch with its own ground sheet that we used for our toilet area. 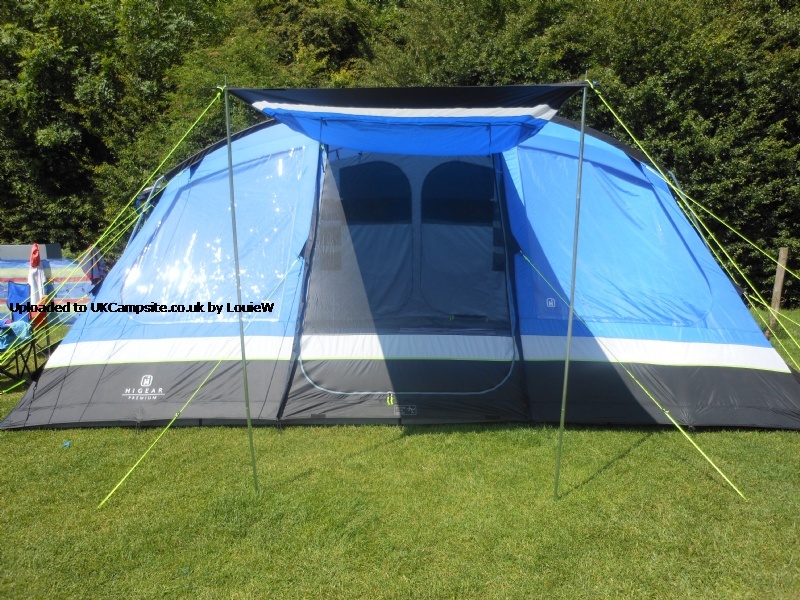 All in all a very sturdy and spacious tent but it is very heavy and bulky. It has lots of pro's and cons but it provided 7 of us (3 Adults 3 Children and 1 Infant)with a very enjoyable luxurious 2 weeks holiday with no problems. We had more space than an 8 berth caravan at less than a quarter of the price. 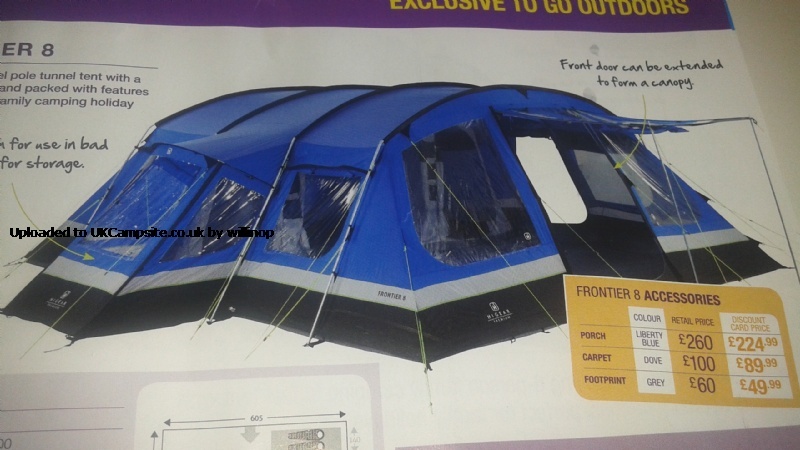 This is a great tent,we got the package tent, footprint,carpet and porch has others have said it is a huge beast put very easy to put up me & my wife did it in about 1 hour including porch.I would take a fold up step for clipping the bedrooms up i`am 5ft 10in and could not reach.Great having ehu points either side and steel poles make it feel very solid had thunder storms and high winds first night tent did`nt move a muscle and no weaks. Just spent 9 days in Norfolk with this fantastic tent in all sorts of weather and wind. 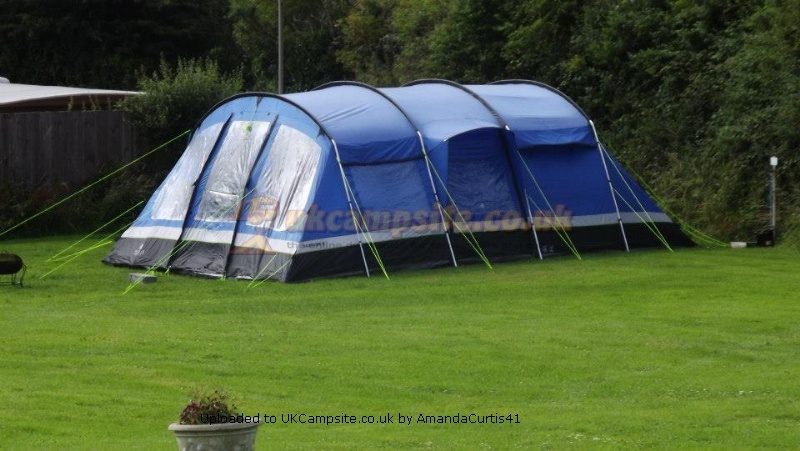 This is a superb and massive tent, possible too big for some sites. We bought the package including the porch, footprint and carpet which made us the envy of the site. No leaks and stood up to almost gale force wind. My only concern would be the weight, it says 32 kg but together with the porch etc it's very heavy indeed. We are lucky as we have a large box trailer. Overall the steel poles makes this a very solid tent and it's given us the confidence to book a pitch for a month and commute knowing it will still be standing when we return. 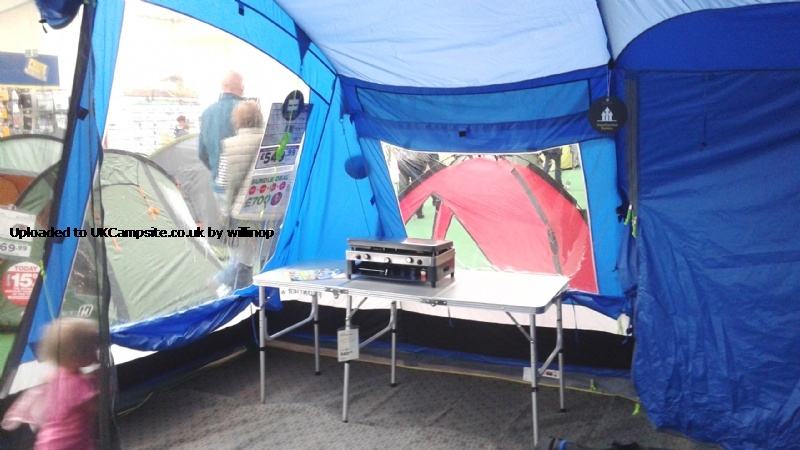 5* Hi Gear, you would have to pay a fortune with one of the top brands to come close to the quality and sheer size of this Top Tent. Just used it for 4 days for the first time. Putting up was the for the first time ever as the weather was too wet beforehand to pitch. It was easy and 3 of us had it up in around 30 mins, in really windy conditions. The wind got even stronger on the first night but the tent stayed solid and felt very secure. It would be better in there was a cable entry point on both sides of the tent, because of the way we had to have out tent pitched, our 10m electric lead was barely long enough to reach in, so we had to run an additional extension lead off of it just to plug in the light and the coolbox we had. The entry is only on the side where the storm porch is so bare this in mind. It could be run through the opposite door but in bad weather it may cause a leak. 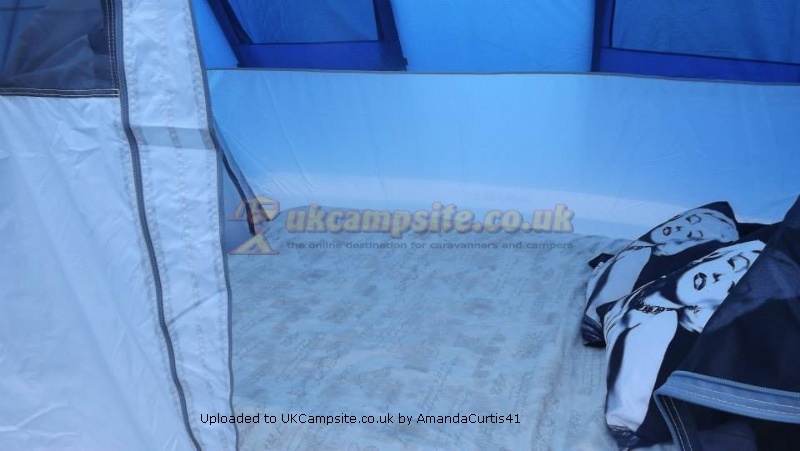 The tent is well made and the carpet is a great addition. There is so much space the kids were running around inside. The only other things I noticed were there weren't enough pegs! 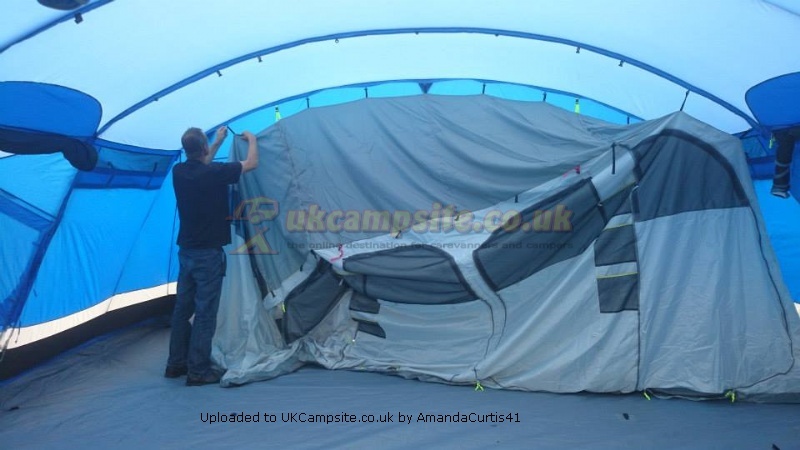 The velcro flaps that hold the 'curtains' up look like they could rip off quite easily if you aren't careful when lowering the curtain and also that the zips quite often get caught on the outside of the tent when closing from the inside, so care is needed when closing up for the night. All in all it is a fantastic purchase and at the price we paid, value for money. It's big and bulky but simple to put up and put away. We had no problem putting it back in the bag. We even had room for the footprint and extra pegs, mallet and mallet in the bag too that didn't come with it. 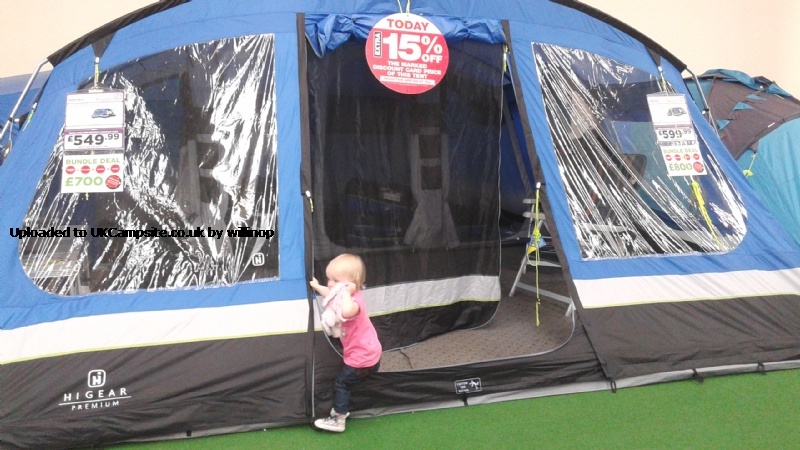 Highly recommend for families who want space when camping. But make sure you book a large pitch as it is too big for a small one. Fab. Fab. Ideal and plenty of space. Family of four. Pod each with one spare as a dressing area. Can dine in porch area if wet. Love it. Everything thought of in design. Should be able to buy carpet for pods justcasxa further layer for warmth when camping early or late season. Very well thought out for families. 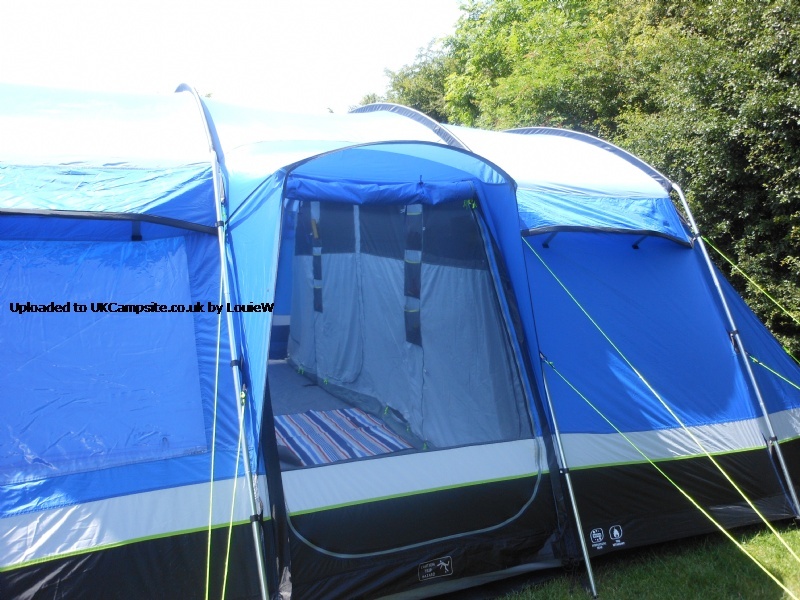 Fantastic tent, but be warned it's a huge beast when up with the porch attached. It withstood torrential rain whilst we were in Cornwall, and was easy to put up in the rain. 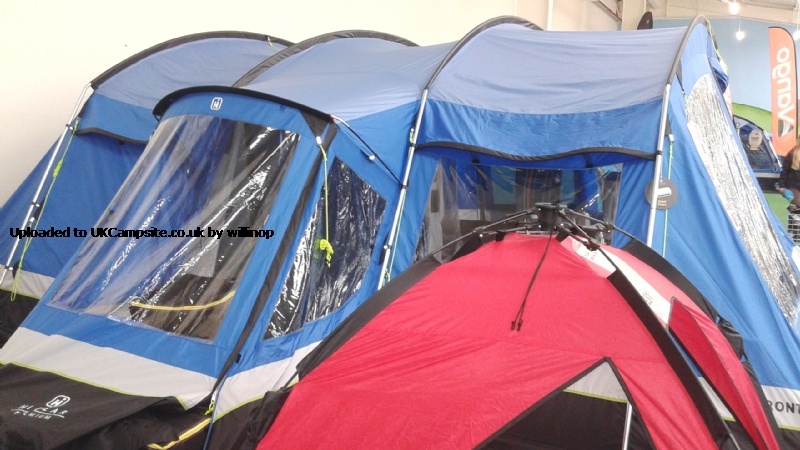 The tent is well made, with plenty of windows and superb ventilation, three rooms run across the rear of the tent, one big room in the centre, two doubles on either side, a great feature is the ability to unzip the dividing walls on either side, or completely remove the two side rooms leaving more space, again with a zip. With the carpet down this tent was cosy, with plenty of room in the living area for the kids to play, or indeed for us all to sprawl out to play card games, or bring the table in and eat if the weather is bad etc. The porch is massive, again room for the table and room to cook as well. Small tip, if you're under 5'8 it would be worth carrying a fold up step to help reach the top of the tent to attach the porch. 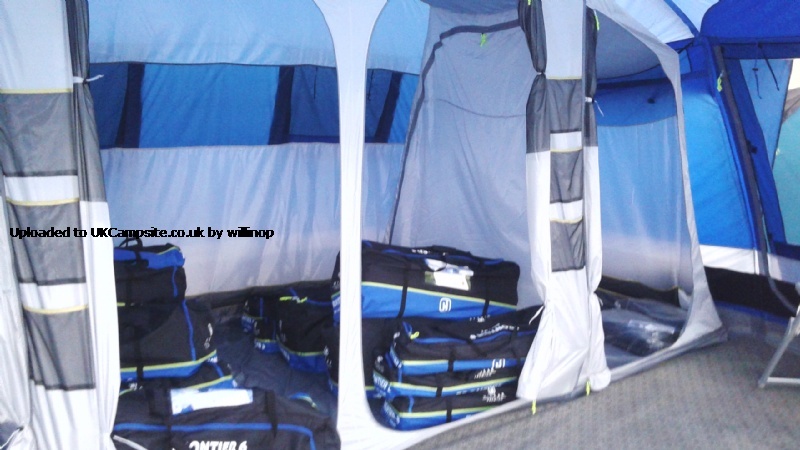 The tent has a small integral porch which has it's own optional groundsheet, this makes a great shoe storage area. The only downside is the main door has two side zips, relying on the inner mesh to close the bottom of, this can flap in the wind so we've put some velcro across the bottom, and the carpet has no way of securing it, leading to it slipping and sliding, velcro again,problem solved. 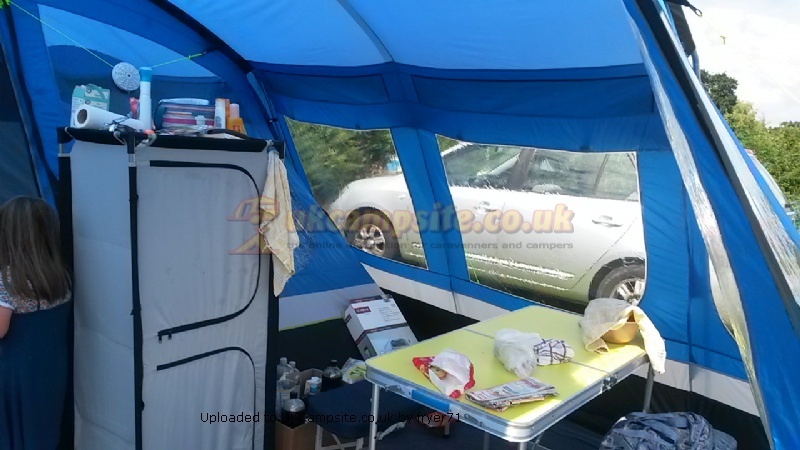 All in all this is a great tent, I wouldn't hesitate to recommend it. Add your review of the Frontier 8! 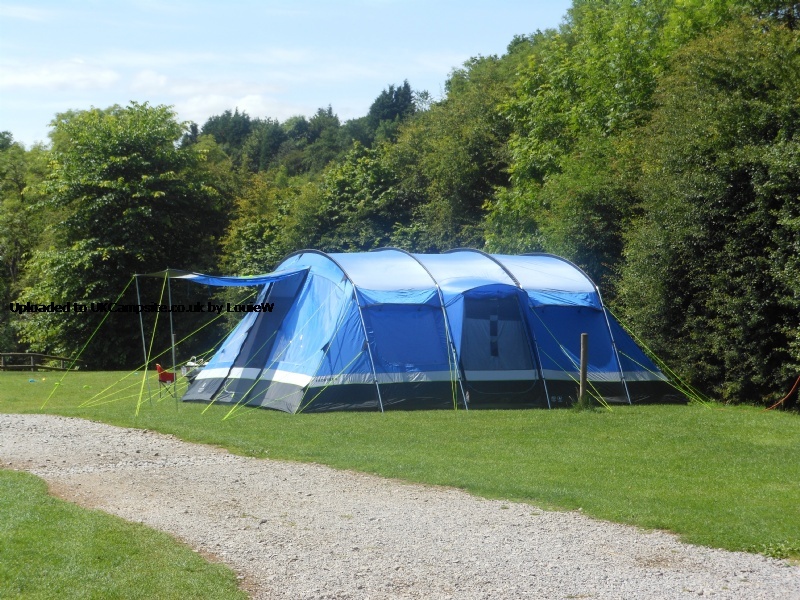 A giant family tent that's very strong and stable, with a roomy living area and panoramic windows. 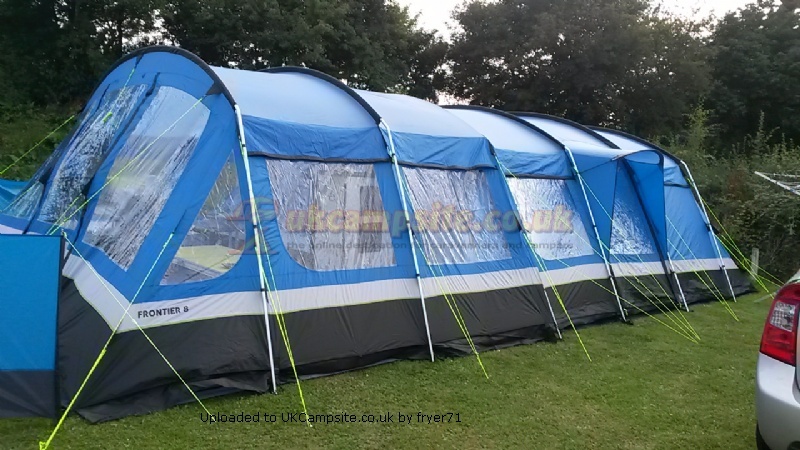 With its huge size, great quality and easy pitching, the Hi Gear Frontier 8 is a luxurious choice for any family camping trip. Very airy and spacious, it has ample room for your family, your gear and your furniture, and is tall enough for you to stand inside without you having to stoop. Stong steel poles give the tent great rigidity, but it's still very straightforward to pitch. The front door can be extended using the included steel poles to form a canopy, giving you more room to spread out, and extra shade from the sun. An enclosed and sheltered side porch entrance is great for when it's raining, and also doubles as an extra area for storing kit. 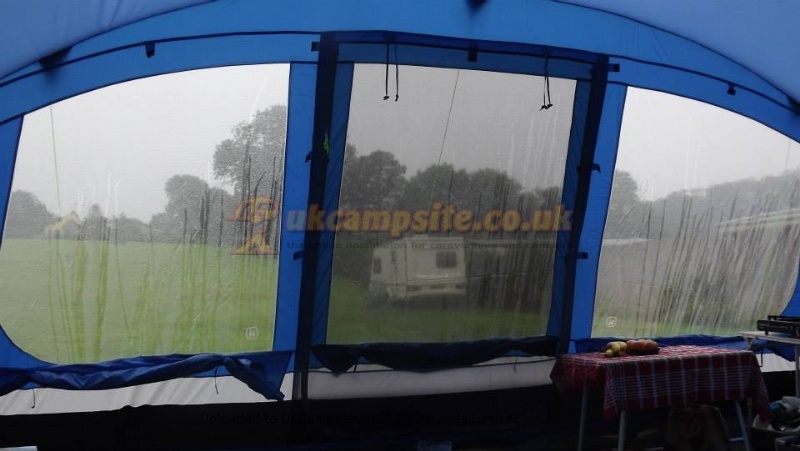 And if the heavens do open, you'll be dry inside due to the flysheet's very waterproof 6000HH rating. And you can make your camp even more roomy by extending your living space with the Frontier 8 Porch, add warmth and comfort underfoot with the Frontier 8 Carpet, and help to protect and insulate the floor with the Frontier 8 Footprint.